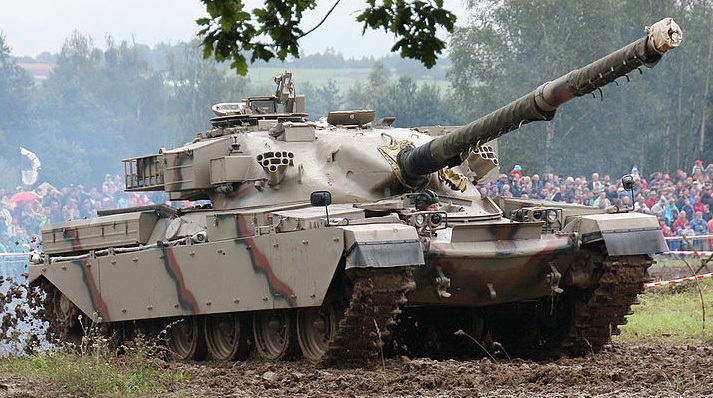 The Chieftain was a development of the legendary Centurion, which introduced the world to the MBT concept in 1945, dominated the battlefield in the Middle East and imposed its main gun as “the” NATO standard during the Cold War. However, the fast pace of Soviet advance in ammunitions triggered a study for a new main battle tank aimed at exceeding all expectations and setting up a new reference for the Cold War. And in 1966, when it entered service, the Chieftain was, indeed, the most formidable main battle tank in the world. The Chieftain’s rifled Royal Ordnance L11A5 120 mm (4.72 in) gun was specifically tailored for it and also became the new NATO standard caliber. Its cross-country speed was better than that of the Centurion, and it could maintain it longer than the lighter Leopard I. The Chieftain also had the best protection of the time. The Chobham armor became a milestone in tank protection development. 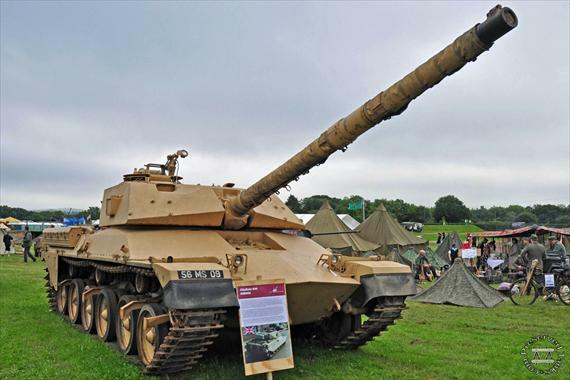 The Chieftain originated from a British Leyland design of a new tank, dating as early as 1950, when the War Office requested a replacement for the Centurion, as the Medium Tank No 2. The Centurion itself was not seen as ideal in firepower since the arrival of Soviet heavy tanks armed with 120 mm (4.72 in) guns like the IS-3 and following models up to the T-10. The British Conqueror heavy tank (1955) tried to respond with a high velocity, long 120 mm (4.72 in) gun, but not surprisingly failed on the mobility aspect. The next tank had to have a heavier gun on a more mobile package. Two main features had to be included, a brand new L11 120 mm (4.72 in) main gun, and protection by new thicker sloped armor, capable to sustain an impact from the new Soviet HEAT and improved AT rounds. It also had to be fitted with the new Leyland L60 engine. 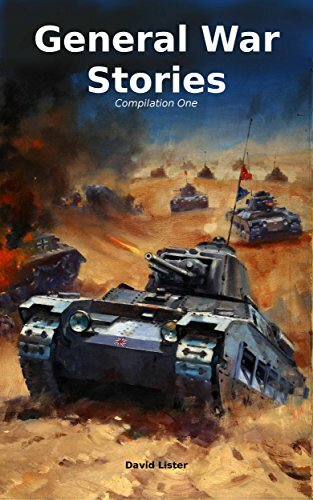 For at least twenty years the “magic triangle” speed-armor-armament was not achieved as well as the Centurion had, because the new engine did not fill all expectations and the sheer weight of armor was not met by an adequate power-to-weight ratio. Although having excellent mobility, the Chieftain was the slowest of the three Cold War British MBTs. The Centurion before and especially the Challenger after, were faster. Design of the Fv4201 started in 1958, and the first prototype was built in 1959. Six other prototypes and a pre-production series of 40 tanks followed from 1961 to 1963. 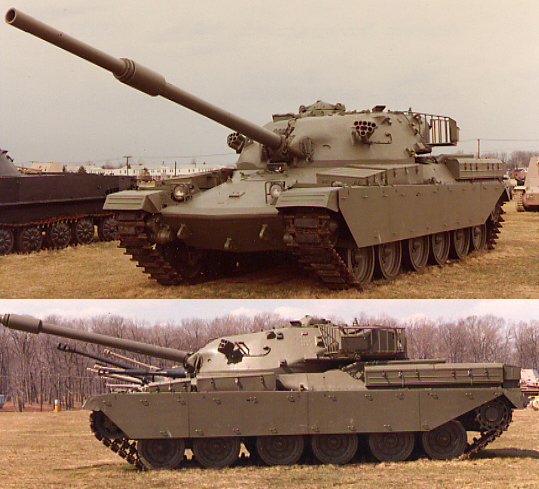 It was eventually accepted for service in May 1963, officially designated the Chieftain Mark V MBT, accompanied by an order for the production of 770. In 1966 the first Mk.Is entered fully active service with the tank units. Chieftain P5 prototype in 1962 (British Leyland). The Chieftain emerged from a brand new hull and turret design. Apart from the tracks and some elements of the wheel train and some mechanical parts linked to the new engine, nothing was shared with the Centurion. The initial design combined some unique features, including a mantle-less turret, allowing superior depression angles. The turret was well sloped and roomy, allowing the loader, commander and gunner to be comfortably housed. A large infra-red searchlight was installed on the left side of the turret. 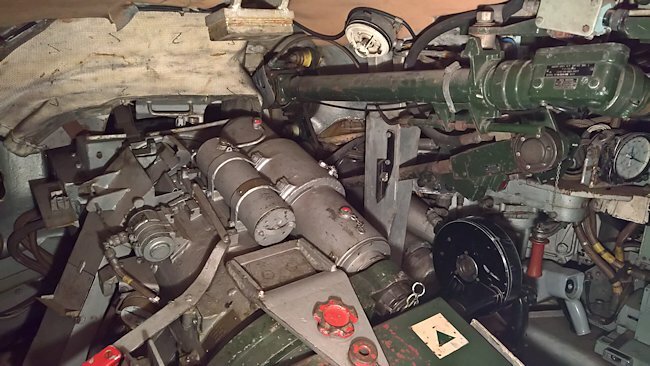 Smoke grenade launchers were mounted on the front of the turret, while the rear received a large gallery to house spare parts and magazines, acting as extra protection. Large storage bins were also mounted on the track covers, and after its introduction into service in 1966, side skirts were added to protect the main part of the tracks. An old Mark I or II preserved at the Aberdeen Proving Grounds, USA. The Mk.I was equipped with the Leyland opposed-piston two-stroke diesel L60, an ingenious design for multi-fuel use. But this engine proved unreliable and not powerful enough to allow speeds even close to those achieved by the first Centurion, with an average 19-22 mph (30-35 km/h). The particular feature of this engine was that, for good combustion, it needed the ignition delay be reduced, thus requiring the internal temperature inside the cylinder after compression to be higher than usual. Engine research started in 1952 and led, in 1956, to the adoption of a family of 6-cylinder opposed-piston engines, like the two-stroke truck diesel, the Rootes TS-3. The latter inspired the LM L60, but with a different mechanical layout. Whereas in the TS-3 pistons were connected by rocker levers to a single crankshaft, the L60 took the path of the 1930s Junkers Jumo diesel, with two crankshafts geared together. But this formula experienced substantial thermal stress problems. The technical solution adopted for the diesel proved unfit for multifuel use and prevented it from reaching the planned output of 700 hp without consequences for the piston and cylinder lining. These issues and the overall weight resulted in a catastrophic 90% breakdown rate in exercises for the Mark I series, never really completely solved, but the output was raised in 1967. Later, additional armor and equipment added their own weight to the problem. In 1974, the newly introduced Belzona variant gave 850 hp, which was a great improvement compared to the original BL with 450 bhp. The final speed was around 48 km/h (30 mph) on road, but this was still below the Challenger performances and dictated a specific tactical use when operating in combination with the latter. 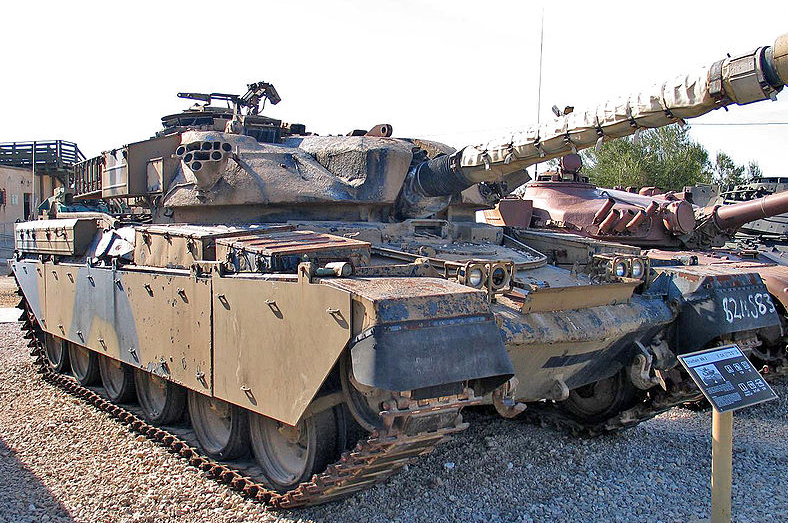 With years of tactical exercises and well-understood limitations, the Chieftain proved a formidable asset in the British Army arsenal. This powerplant’s output was passed to the rear drive sprockets, served by a supine driver’s “hot-shift” epicyclic gearbox. The weight was distributed among the six doubled roadwheels, three double return rollers and one idler per side. However, the suspension was the same Horstmann type as that of the Centurion, but poorly suited for the L-60 two-stroke diesel. The latter was specially developed for it, as an ideal engine to meet the contemporary demand for multi-fuel types, because of its opposed piston configuration. But this choice made it inherently troublesome, a fact which would appear later. The Leyland L.60 diesel also mirrored the adoption, on the other side of the Channel, of the Hispano-Suiza HS 110 diesel for the contemporary French AMX-30. These engines helped achieve the 1957 NATO objective to run fuels ranging from light diesel to aviation high octane aviation gasoline (AVTAG/JP-4). But, in this case, refueling operations and training needed extra care, maintenance was an issue and combustion was sometimes difficult to achieve without delays, especially for 80 octane combat gasoline. The AMX-30 multifuel engine was equally troublesome in this respect. The muzzle velocity and accuracy of the new main Royal Ordnance L11A5 rifled gun easily compensated for the early lack of mobility. It fired separated ammunition with fully combustible bagged propellant charges. The turret was fitted, since the beginning, with a coaxial L7 and later L8A1 7.62 mm (0.30 in) machine-gun, with a second one in commander’s cupola and a Marconi FV/GCE Mk.IV A cal.50 (12.7 mm) ranging gun was mounted over the main gun, capable of ranges up to 2400 meters (1.49 mi), but 1800 m (1.2 mi) was more usual. But at 2000+ meters machine guns cannot be used practically, and the gunner had to rely on visual magnification, his graduated sight and own skills. Ammunition comprised HESH (high explosive squash head) and APDS (armor-piercing discarding-sabot), with 62 rounds carried. It took more time to engage successive targets with it than with the contemporary fire control system of Leopard 1, which was based on an optical rangefinder. All this and the development of other, more accurate means of determining the range of targets, confined the use of ranging machine guns to only three major types of tanks. The first of them was the Centurion, the improved 105 mm (4.13 in) gun versions having begun the use ranging machine guns in 1962. By then the 12.7 mm (0.5 in) ranging machine gun had also been adopted for the Chieftain, which was produced with it until the mid-1970s. The Chieftain introduced a supine (reclining backward) driver position, allowing a heavily sloped front hull -and thus better protection- while remaining lower. The 1990s Chieftain incorporated the “Stillbrew” armor named after Colonel Still and John Brewer from the Military Vehicles and Engineering Establishment (MVEE), the Improved Fire Control System (IFCS) and the Thermal Observation Gunnery Sight (TOGS). The NBC lining was continuously improved. The front armor, made of steel, had an equivalent thickness of 220 mm (8.66 in). Alternative armor versions were also tried, like the ROMOR-A armor kit, and the Varma passive/reactive explosive armor bricks. Major addition was the Stillbrew add-on package, covering a few areas of the turret, made of concrete with rubber blocks sealed with a plastic coating. Close-up of the Stillbrew armor (official documentation). The large rotating commander’s cupola had nine openings, a periscope, an infra-red projector with up to x8 magnification power and an alternative IR vision system. The commander’s sight had a unit power channel and the binocular periscope had x10 magnification (later x12 on the mark II and x15 on the Mark V). The turret’s main infrared range-finder was coupled with an armored searchlight with a maximum range of 0.93 miles (1.5 km). The interior was lined with a complete NBC system. Nine prismatics blocs/periscopes formed a completely separated ring mounted on ball bearings. The principal advantage of this was a substantial mass reduction of the cupola, which could scan the horizon independently of the turret. A “low-tech”, more economical method of ballistic ranging was first developed for the Centurion and was also used by Chieftain gunners. It involved a modified 12.7 mm (0.5 in) machine gun to find the range by firing successive bursts in a precise pattern to calculate the trajectory. The gunner had to pick the corresponding mark appropriate to the type of gun ammunition to be fired, laying it on the target. The range of the target was so determined with a high degree of accuracy, also having the advantage of considering trunnion tilt and crosswinds. However, it could disclose the position of the tank prematurely. Although simple and robust, it took a substantial time and precious time. This was not such a disadvantage at that time, as the T-54/55 and especially the T-62 had long reload and traverse times. In the 1980s it appeared as a “B-plan” in case of a failure of the other systems, as much faster and more precise electronic ballistics computers prevailed. Both the gunner and commander had a firing switch for the gun, while the commander had an override. Ammunition used Antipersonal HESH, armour-piercing APDS. 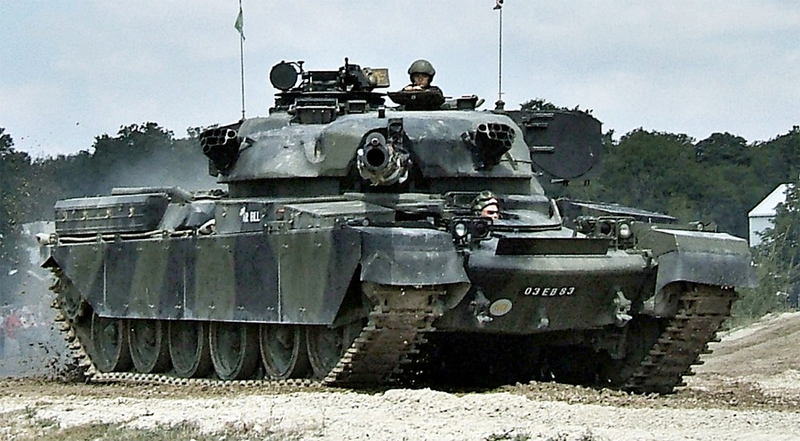 The Chieftain remained front-line in British service until 1996 and its development went through 12 different marks and some additional submarks. Outside an updated infrared/white light searchlight online with the gun for target illumination, the FCS evolved to a laser rangefinder. A digital computer was soon introduced to automatically set up the ballistic solution, preparing the respective offset laying for each target. There were also minor electronics or protection upgrades (new NBC lining), improved classified armor, Thermal Observation and Gunnery Sight improved or upgraded to the Challenger I level. However, most of the evolution was aimed at solving the mobility issue, calling an upgraded powerplant. 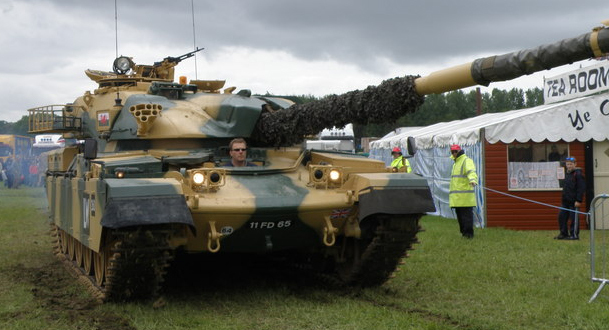 The experimental Chieftain 900 with Chobham armour, which served as a testbed for the future Challenger-I. The Mk.1 (1965) first batch of 40 pre-production vehicles was so underpowered that the all lot was quickly re-affected for training duties. The Mk.2 (1967) were fitted with a more powerful 650 hp engine. The Mk.3 was fitted with additional equipments, dry-air cleaner element, modified No 15 Mk 2 commander cupola, upgraded engine and gave birth to Mk 3/2 (Improved electrical equipment and air cleaners), Mk 3/3 (ER RMG, laser rangefinder, 720bhp engine & modified NBC pack), Mk 3/3P (Iranian version), Mk 3G (Prototype with turret air-breathing for engine aspiration), and the Mk 3S (Mk 3/G with turret air-breathing and commander\’s firing switch). The Mk.4 were two prototypes with increased fuel capacity and other minor modifications. The Mk.5 (1970) was the final production (based on the 3/3) version with a new 850 bhp engine and improved NBC protection (turret bustle). The Mk.6 (1979) was an upgraded version, a Mk 2 rebuilt to Mk 5 standards. All previous tanks were fitted to this new standard which introduced Clansman radios and many other improvements. The Mk.7 was a Mk 3 rebuilt to Mk 5 standards. The 7/2c was supplied to Oman. The Mk.8 was a Mk 3/3 rebuilt to Mk 5. The Mk.9 was essentially a Mk.6 fitted with IFCS. including the fitting of new Clansman radios. The Mk.10 (1985) were Mk.6 and Mk.7 fitted with IFCS & Stillbrew. The Stillbrew crew protection package was applied to the turret front and ring and became the new standard. The Mk.11 (1988-1990) were Mk.8s fitted with IFCS, Stillbrew, No 11 NBC system, and TOGS. The TOGS (Thermal Observation and Gunnery System) was manufactured by Barr and Stroud and was completed by the addition of a laser range-finder. Other Mk.12/13 upgrades were canceled as the Challenger II entered service. However the cancelled Iranian version that was used as the basis for the Challenger 1 MBT. The experimental Chieftain Sabre SPAAG. (credits : jedsite). This was a testbed for the Chobham armour. The hull glacis and sides, the turret, were entirely new, and this version formed the basis for the next generation of MBTs, the Challenger 1. This was an armed recovery and repair vehicle. The bridge-layer version (designated n°8 to N°12 bridge) equipped with a scissors-type bridge. A Close Support Bridge System was also tested. The AVLB Mk 6 was a Chieftain Mk 1/4 converted with mountings for FWMP and fitted with additional armor. The main combat engineering vehicle, used by the Royal British engineers. This SPAAG was a twin-gun anti-aircraft version, with a Marconi Series 400 radar and swiss Oerlikon 35 mm autocannons. None was exported. It was another SPAAG prototype, with a flat-plate turret, multi-angle front, tapering bustle, and a Twin barrel, 30mm, with multi-perforated muzzle-brakes. Outside the initial production prototypes PP1, G1 and GT, a mine clearer version kit was developed, as well as the Chieftain Casement Test Rig, the Chieftain SID (modifications set to reduce its signature), another tested the ROMOR-A armour kit, the Varma ERA set, or to test the Vickers/Air-Log Ltd Hydrostrut suspension. Chieftain AVRE with the Royal 12th squadron of engineers, training in Canada. 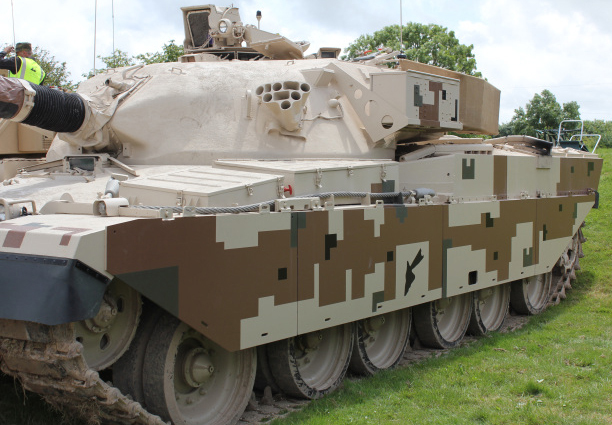 The Chieftain, like the Centurion before, was largely exported to the Middle East, but failed to be adopted by any country within NATO, choosing the German leopard instead. 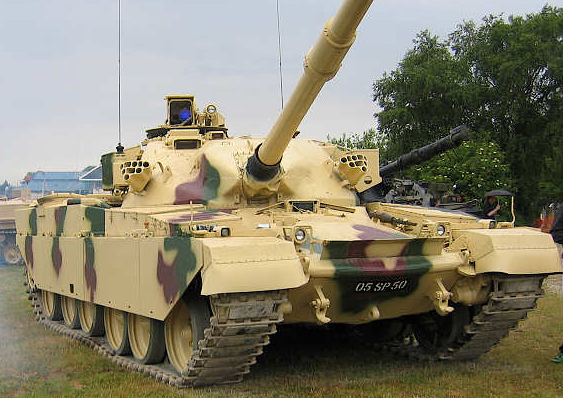 The Chieftain was proven in combat and showed adaptability to upgrades such as overall improvement or for local modifications on the export market. A new commander’s cupola was devised, an uprated engine introduced and additional equipment added to make the Mk 3 variant. 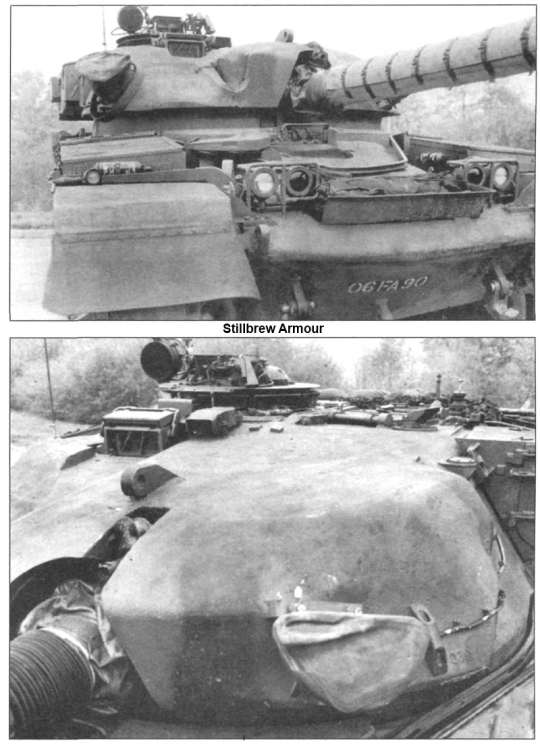 The final definitive Chieftain production model became the Mk 5 and these added NBC protection units at the turret bustle as well as further uprated engines. An agreement was cancelled by the British Government in 1969, despite the efforts already put into the local adaptations of the tank for IDF, including the use of an improved hull-down firing capability which served the Israeli Centurions so well in 1967. However this development served as a blueprint for the creation of the Merkava, led by General Israel Tal, largely involved in the local Chieftain project. The first main export variant was the Khalid Shir (Lion) also known as the 40302PJ for Jordan, which included the running gear of the Challenger Mk.I he Jordanian Shir 1 comprised 274 tropicalized tanks which were delivered from 1980 to 1985. The FV4030/1 (Mark V 3P) was exported, then the Shir 2 (FV4030/3) which was a Jordanian Shir 1 (FV4030/2) upgraded at Leeds for Iran, with a reworked rear which allowed to mount the more recent Rolls Royce CV8 engine of the Challenger. The Shir 2 was basically an improvement of the Chieftain Mk.V built exclusively for Iran, which still remains today in first line service. These were upgraded locally as the Mobarez package. Other variants of the Chieftain were sold to Iran from 1975 to 1979, with 707 Mark 3P and 5P, 125-189 FV-4030-1, 41 ARV and 14 AVLB being delivered before the revolution. The Iranian Chieftain was used extensively in the Iran–Iraq War of 1980-88 apparently with mixed results resulting mostly of engine breakdowns. In early 1981 the Iranian Chieftains and M60A1 took part in the biggest tank battle of the war, loosing some 200 tanks while Iraq lost 50 T-62 tanks. About 50-75 Chieftains (ex-Kuwaitis) were in service with the Iraqi Army in 1990. They were later upgraded to Khalid-level (4030P2J) with Air-conditioning and reinforced armour, plus improved night vision. Their fate in 2001 is not known. Kuwait (267 from 1976 to 1995). 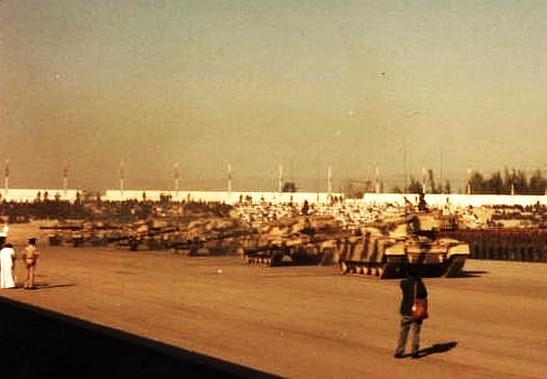 The Kuwaiti 35th Armored Brigade saw heavy action at the Battle of the Bridges, against some elements of the Iraqi Hammurabi and Medina divisions. After crippling losses, they had to withdrew over the Saudi border and a total of 136 tanks were captured by Iraq. Apparently only 7 tanks managed to survive the war. Oman took delivery of 27 Chieftains Vs, later upgraded to the Qayd Al Ardh standard fitted with L20 sight and Type 520 laser rangefinder. All these are still in first line service. The Challenger was planned in 1985 to replace the Chieftain, but was largely based on the Chieftain FV4030/4, cancelled Iranian Shir 2 and late Chieftain 800, 900, 1000 and 2000. Technological improvements were mostly new electronic and numeric device and range-finders, communication system, ammunition loading, updated armour and a much more powerful Rolls-Royce engine. The latter provided a much needed greater speed, although the mechanical gear train and hull were basically unchanged since the Chieftain. 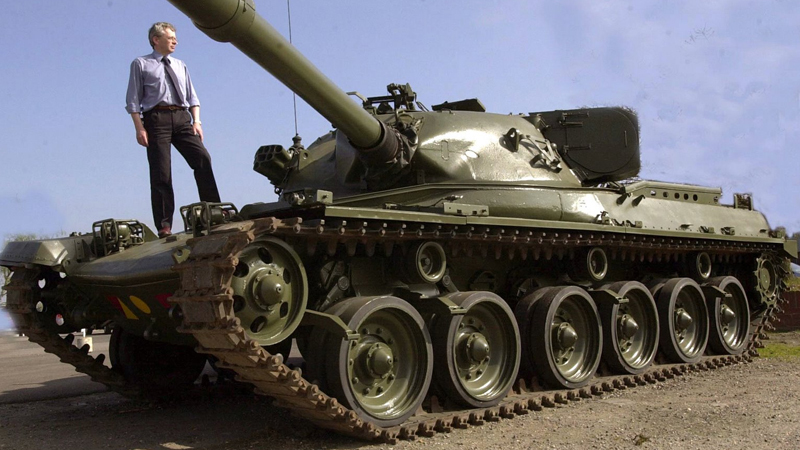 The first tanks were delivered in 1990. 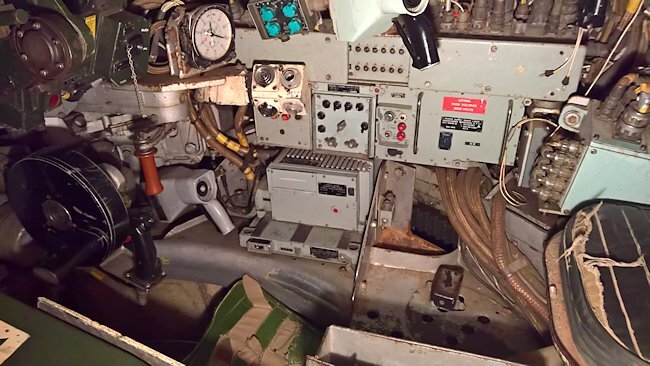 Inside a Chieftain Tank Mk2/3. Driver’s and commanders seat. The diver had to rest his back against the commander’s legs. There was no back rest. FV 4201 prototype as delivered for trials in 1962. Notice the small commander cupola, absence of side skirts or thermal sleeve around the main gun. Chieftain Mk.1 main battle tank. The first production version were used until the year 2000 as training tanks. 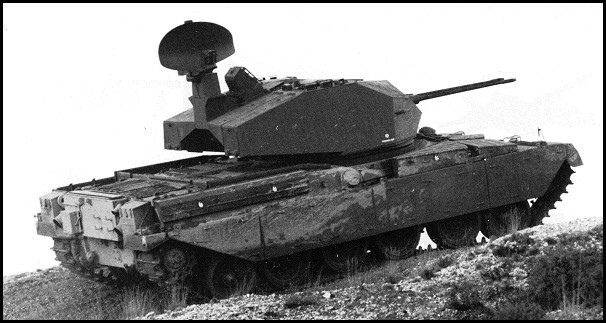 Chieftain Mk.3 in the 1970s. The Chieftain Tank Mk.3 BAOR of the West Berlin infantry brigade in the 1980s, with this famous 1980s urban livery by Lt.Col. Clendon Daukes. Early Chieftain Mark 5 in manoeuvers in the 1970s. Chieftain Mark 5 BAOR of the British Army stationed in belgium, 1979. Chieftain Mk.7 from the 4th battalion Royal Tank Regiment stationed near Tilworth in 1984. Chieftain Mark 10 BATUS British Army training unit at Suffield in the 1990s. Chieftain Mark 11 BATUS (camouflage), equipped with TOGS, British Army training unit at Suffield, early 1990s. Iranian Chieftain Mihr. Shir-II update. You show a picture of a super chieftain, but what exactly is it? 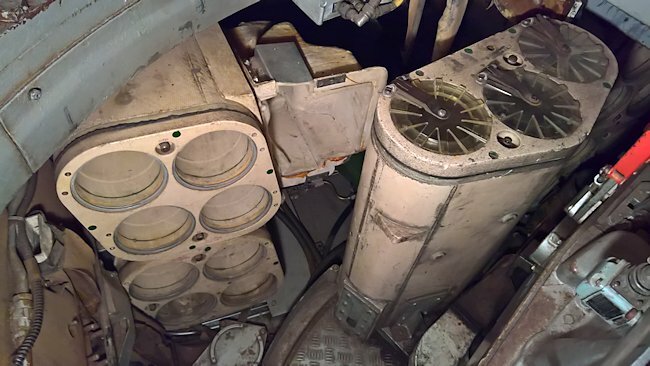 Sir, your article on the Chieftain FV4201, inside the Chieftains hatch contains a error, being the driver and commanders position, it is in fact the gunners and commanders positions and the gunner had a removable back rest. The caption below the picture of the interior of the tank has a mistake. Is not the driver’s seat, its the gunner’s.